A glass electrode consists of an electrode membrane that responds to pH, a highly isolating base material to support the unit, solution inside the glass electrode, an internal electrode, a lead wire, and a glass electrode terminal. The most critical item in this system is the electrode membrane. First, the membrane glass must generate a potential that accurately corresponds to the pH of the solution. Second, even though it must be accurately sensitive to acidity and alkalinity, it must not be damaged by them. Third, the electric resistance of the membrane itself must not be too large. Fourth, too large a difference in potential (asymmetric difference in potential) must not be generated between the solutions inside and outside the electrode when the electrode is immersed in a solution of identical pH to that of the solution inside of the electrode. Another requirement is that the glass membrane be resistant to shock and chemical reactions. Generally, silver chloride is used as the material for the internal electrode. Potassium chloride solution maintained at pH 7 is usually used as the internal solution. In 1906, Cremer blew the tip of a glass tube into a bubble and measured the difference in potential between two kinds of solutions (0.6% NaCl + diluted H2SO4 and O.6% NaCl + diluted NaOH). This is considered the birth of the glass electrode. In 1909, Habert and Klemensiewicz measured the difference in potential between a silver chloride electrode and a mercurous chloride electrode, and found that they could obtain a titration curve similar to that of a hydrogen electrode. They called this a glass electrode. So, the glass electrode took its first step toward becoming a practical pH electrode. However, early glass electrodes had large electrical resistance and very thin glass membranes. Therefore, they were very fragile and difficult to handle. Later, with the introduction of glass containing lithium, which is chemically strong and has low electric resistance and with development of technology for fabricating electronic parts and insulation materials, the glass electrode made rapid progress after the Second World War. 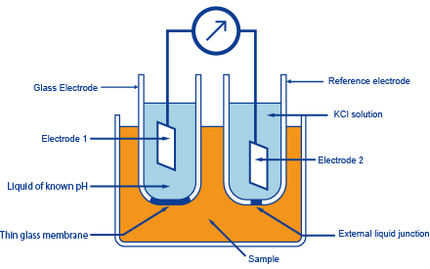 Now it is widely used as the standard for measuring pH. In Japan, Professor Tatsuzo Okada of Kyoto University launched a study on lithium glass electrodes right after the end of the war. Also, studies on reference electrodes and amplifiers were carried out by people in various fields. HORIBA Radio Laboratory (the predecessor of HORIBA, Ltd.) introduced and integrated these technologies and developed the first glass-electrode pH meter in Japan in 1950. Moreover, HORIBA introduced a two-dimensional processing technique in creating the structure for the glass electrode and succeeded in the development of the "sheet-type combination glass electrode," which enlaces the glass electrode and reference electrode, and is only 1 mm in thickness (see the figure at right).